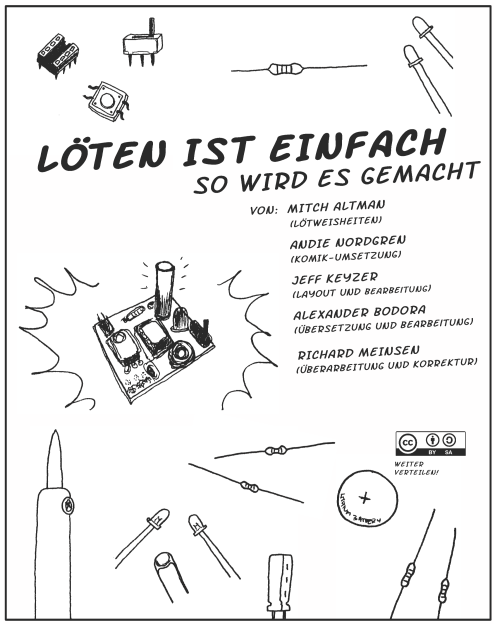 I’m pleased to announce that we finally have a very nicely done German translation of the Soldering is Easy comic book. A huge thanks to Alexander Bodora and Richard Meinsen for volunteering to do the translation! I also updated the original comic to include a link to the Soldering is Easy comic book download page (http://mightyohm.com/soldercomic). I heard a couple requests for this at the Maker Faire last weekend – so there it is. Is this about language or soldering? Maybe we should start a committees and discuss the formulation of each sentence. Each sentence will get its own sub-committee. I suggest bi-weekly meeting for the sub-committees and bi-monthly meetings for the head-committee. And we should only accept material that gets 100% consent. Each sub-committee has a veto for all the other sub-committees btw! streamlining is a very nice word for what you people are actually complaining about. But seriously, I translated the book using stupidly simple sentences, that even a child can understand. I know my german. I know that the verb “anfangen” is devived into “fangen and an (in then end)”. But honestly think about it. If you try to give a child commands: you do not make a complicated sentence like that. You say: “wir fangen an – mit einem widestand.” Besides that I kept the translation very literal. If I would have not done that, I would have probably needed to rewrite everything. My grammar is not wrong its just purposly altered to convey a certain mood and point in that book. Maybe my translations in general are a little “unlucky” becauser I have been born and raised multilingual. I see many things people just take for granted by reading a dictionary, where I think it can be done better. Lötmetall is an actual word and it’s used widely in books, at least the ones I read. Besides that, it’s a perfect example of what I mean. It’s a much better word for “Lot” or “Lötzinn” because not every “Lot” is made out of Zinn and Lot is not selfexplanatory as german language usually is. I also kinf of noticed this to be a generation question. Most of the young people I know say Lötmetal where as the older people say Lötzinn because back in the day, that is all they had: Zinn! In my personal opinion: all word that exist a wrong, because actually what we are using is a “Lötlegierung”. I have the impression that everyone is complaining because I didnt translate it for adults. I actually translated it with an eye kept on 6-12 year olds. I also kept it more informal and funny than written german language actually is – just because the original was like that. We very well speak in germany: “Wir fangen an mit…” but we truely never write it. BUT I did it anyways! thus I really appreciate your work on translating the Comic, I (too as a native german speaker) have to agree with Marvin that your translation is often not very ‘lucky’. I do have problems in particular with your grammar and syntax. Your sentences may form valid german sentences, but no one would acutally say – or write them down the way you did (Note: Writing your own text and translating is a very different thing!). Please don’t get me wrong; I just meant that your text needs some ‘streamlining’.. I just read this part and I think you are drunk! You really wanna make an issue about the word “passiert” versus “geschieht”. That is like “color” vs. “colour”. What the hell? Give me a break! On first glance I have to disagree in many points and with some I have to agree. Firstly, I am a native speaker currently living in Berlin germany. Secondly, my formulation war pretty correct and valid standard. Sofar no professor had any problems with my academic writting style. Thus I think it is safe to assume you are just being overly picky. If you have not read the comic in its orignal form, I would like to point out that it is kind of written for absolut idiots and newbs. I made an effort to keep it simple and in many areas you can not translate 1:1. I used that space to add new information. Now, I have to point out that every sentence in german that starts with Ähnlich suggest already a high level of informality. Actually that by it self is BAD WRITTREN GERMAN! But that’s not the issue, because the whole book has a informal nature. In addition which form is correct is a subjective thing. Either way works. I chose my formulation, because it fit into the flow of the text. I know my sentence structure very well, and for an academic paper I would chose yours, but for a COMIC?! HELLO! I will review the rest of your input and also change the parts I saw sofar, where I need to agree with you. Thank your for your input. Please feel free to submit your own alternative version of the book to Jeff Keyzer. The spanish comic also has two. I actually don’t want to argue with you on this. I think it is a nice thing to have many translations of basic documents like these. So maybe I should have thanked you for your work before starting to offer alternative formulations. > Secondly, my formulation war pretty correct and valid standard. Sofar no professor had any problems with my academic writting style. Thus I think it is safe to assume you are just being overly picky. Most of my corrections were not of your style but of simple mistakes. Though I cannot say that I like it, it is your style and I have to live with it. I also don’t think that I write perfect German – on the contrary. I hate German so much I do most of my work in English even if I don’t have to. > If you have not read the comic in its orignal form, I would like to point out that it is kind of written for absolut idiots and newbs. I made an effort to keep it simple and in many areas you can not translate 1:1. I used that space to add new information. > Now, I have to point out that every sentence in german that starts with Ähnlich suggest already a high level of informality. Actually that by it self is BAD WRITTREN GERMAN! But that’s not the issue, because the whole book has a informal nature. > In addition which form is correct is a subjective thing. Either way works. I chose my formulation, because it fit into the flow of the text. I know my sentence structure very well, and for an academic paper I would chose yours, but for a COMIC?! HELLO! That is correct, I also just pointed out that it is uncommon. I think, for someone who is restricted to reading simple sentences, as you pointed out above, some of the target audience by this comic is, this will be definitely harder to read than my suggestion. As I think you are aware, I did not write the translation. However, I really appreciate your feedback and I will direct your comments to the translators. Thanks! hmpf, now i hit the submit button by accident. But, however. Going on. * “Aehnlich dem Zeug, das benutzt wird zum Violinboegen einreiben” is a very uncommon form. “Aehnlich dem Zeug, das zum Violinboegen einreiben benutzt wird.” would be correct. * “Alle Bauteile haben Drähte die aus ihnen heraus stecken:” -> “Alle Bauteile haben Drähte die aus ihnen heraus reichen:” The verb “stecken” implies the contrary than “heraus”. And you might want to get a native speaker who corrects the rest of this translation. I bet robert means the one page solder comic from last year with this aweful font the person used for the translation of the german version. I searched about 10min to find this font on dafont.com. I also had other candidates, but this one made the book. DigitalStrip sadly does not support german extra-signs, otherwise I probably would have used it too. Well… isn’t this font the one used in the original English version? Or at least it’s pretty close to that. I like it. The one I got to see in a previous post announcing a German translation was pretty orthogonal to this one. It’s so spiky. If you should know the cartoon ‘Heidi – Girl of the Alps’ … there was a nurse / chaperon called Mrs. Rottenheimer (should have been named Rottweiler btw.). Every word of her actually cut into my flesh just by listening. The previously used font has the same effect. Hahaha, I’m not sure which version contains the offending font, but the original comic uses a font called DigitalStrip, this German version uses SF Arch Rival. And very pleasing to the eye as well! This font is as pleasing to the eye, as honey is to a sore throat. I guess you don’t like the font we used in the original version?